Our findings support the reliability of the ACRIM composite as the most likely and precise representation of 35 years of TSI monitoring by satellite experiments. The only caveat is that the ERB record prior to 1980 may require some correction for degradation, but available evidence indicates that it would be much less than used in the PMOD composite. We argued that the ACRIM composite most closely represents true TSI because the very corrections of the published TSI data made by Fröhlich to construct the PMOD composite are not supported by a direct comparison between ERBE and ERB records in the proximity of September/October 1989. Direct comparison of ERB and ERBE during 1989 showed that Fröhlich’s postulated Sep/29/1989 step function increase of ∼0.47 W/m2in ERB sensitivity, which coincided with a power down event, did not occur. The KBS07 proxy model does not support Fröhlich’s ERB ‘glitch’ hypothesis either. A divergence between the two satellite records did occur in November 1989; but this is more than one month later and clearly not associated with the ERB end-of-September power down event. 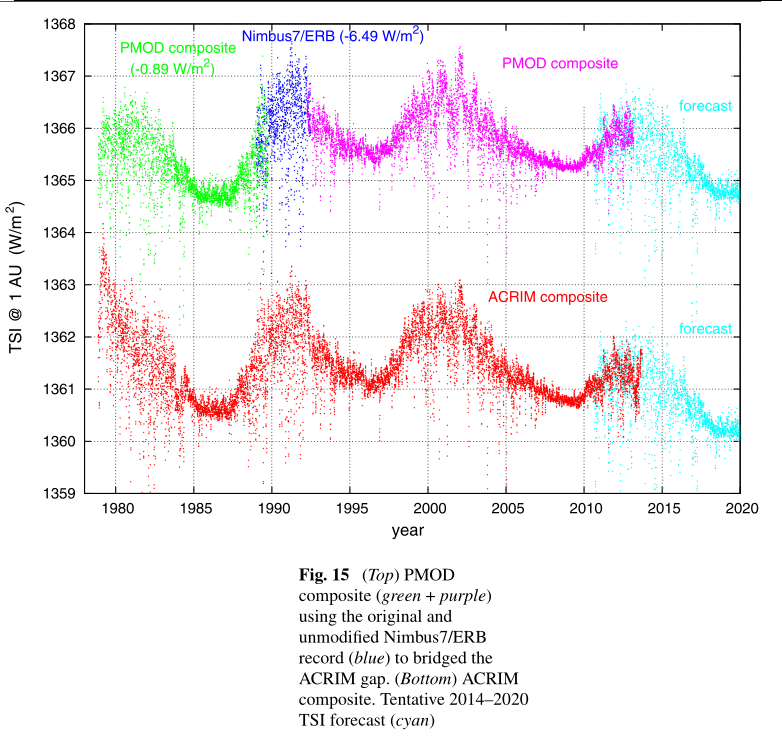 We have demonstrated that the update of Lean’s TSI proxy model (Kopp and Lean 2011), used originally to validate PMOD’s lack of trending from 1980 to 2000 (Fröh- lich and Lean 1998), has inadequate predictive capability to properly reconstruct the TSI decadal trending. Lean’s model predicted an upward trend between the TSI minima in 1996 and 2008 while both ACRIM and PMOD present a downward trend. (3) ERB did not experience either the end-September 1989 step function drift in sensitivity or the upward linear drift claimed by Fröhlich during 1990–1992.5. The latter result is also evident in the upgraded SATIRE model (Ball et al. 2012). Thus, if ERB requires some correction during the ACRIM Gap, our results suggest that Fröhlich overestimated those corrections by at least a factor of two due to the fact that at least one of the two hypotheses (the ERB glitch in Sep/29/1989 or the ERB drift from Oct/1989 to 1992) are not confirmed by our cross-analysis. 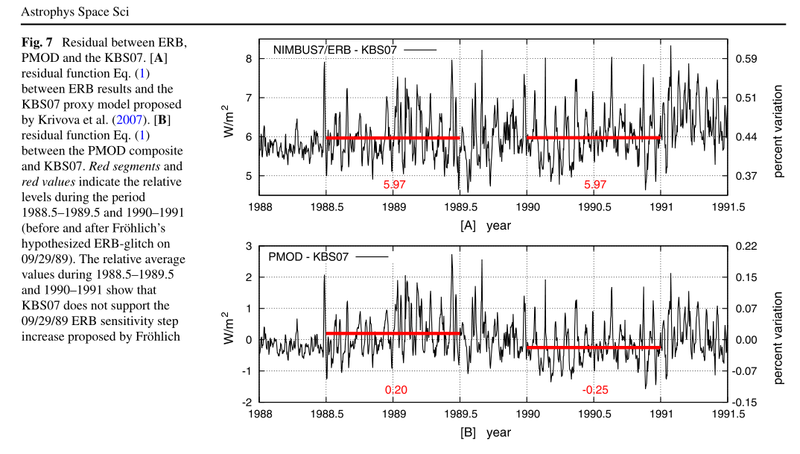 The ERB-ERBE divergence during the ACRIM Gap most likely resulted from uncorrected degradation of ERBE in its first exposure to short wavelength fluxes driven by enhanced solar activity during the 1989–1993 solar maximum or other events. 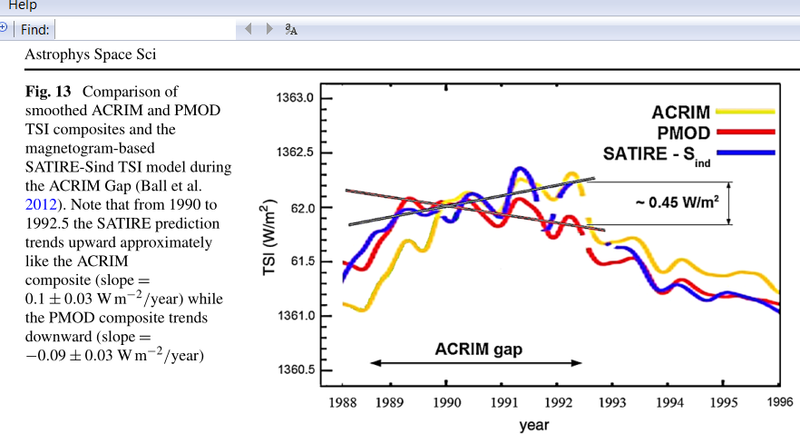 Consequently PMOD should be shifted upward by about 0.5 W/m2after 1992 which produces a 1980–2000 TSI upward trending similar to that observed in the ACRIM composite. Our results demonstrated that the validity of TSI proxy models should not be overestimated since they frequently produce conflicting results and contradictory features. Although the TSI proxy models proposed by the Solanki’s science team (KBS07 and WSKF06) appear to reproduce the lack of a trend during solar cycles 21–22 in the PMOD TSI composite, they contradict one or more of the hypotheses advocated by PMOD to alter the originally published TSI used in constructing the PMOD TSI composite. Thus some of the arguments used to promote the PMOD composite (Fröhlich and Lean 1998; Wenzler et al. 2006; Krivova et al. 2007; Wenzler et al. 2009) are little more than speculations and coincidences. Moreover, the TSI models proposed by Lean and by Solanki’s science team differ significantly from the TSI model proposed by Hoyt and Schatten (1993) who constructed a TSI record since 1700 using five alternative solar irradiance proxy indexes—sunspot cycle amplitude, sunspot cycle length, solar equatorial rotation rate, fraction of penumbral spots, and the decay rate of the sunspot cycle. Now that Anthony Watts has said he’s stopped reading this blog, I feel much freer to give this wise monkey the crit he deserves for the illegitimate way he and Leif Svalgaard have treated Nicola Scafetta’s scientific work. About two years ago Steinhilber et al (with an impressive array of 13 scientists including Abreu, Beer, McCracken etc) published Holocene TSI reconstruction. According to Dr. Svalgaard (and I presume number of other solar scientists and researchers) the work is the Holocene TSI reference. The paleoproxy studies are a completely different issue from the satellite measurements. So while I’ll happily agree with you and Leif Svalgaard that the work you refer to is gold standard for that discipline, it isn’t really related to this issue, where Leif Svalgaard sides with the modeler Frohlich, against empirically based analysis by Willson and Scafetta. I notice that in the TSI plot on your linked page, the Chinese cave data overlays the TSI reconstruction, whereas in the Geomag plot, it’s behind the Geomag curve. I think that makes a difference to the perceived correlations. They’re both interesting plots though, so thanks for posting them. As I say in the paper there is a need to see the next solar minimum to have a more accurate idea of the multidecadal variation of TSI. Our Figure 15 gives a projection based on the variability implicit in the ACRIM composite. Everything would also fit with my three frequency planetary model of solar variability. Sorry I haven’t had enough time to add more of the figures from the paper. Everyone should download and read it. I’ve added fig 15 in at the foot of the article. It’s good to see a scientist making predictions which can be tested in the not too distant future. Personally, I think the Sun is going to surprise us. I think there is a possibility that rather than descending to a low minimum in 2020 we will see a low resurgence in 2018 which will last until around 2024. Perhaps decades later it will be seen as a ‘lost cycle’ like the one some people think occurred near the start of the Dalton minimum. Time will tell. I can’t be the only one who now looks at his with a “skeptical” eye: his war seems based more on position than science, a shift in authority rather than a shift to individualized determination of what one should think or do. The hard right and the hard left leave similar fields of destruction behind them. Those at the top just wear different styles of suits. Rog: Don’t feel left out – Willis has been calling me all sorts of names for pointing out that simple does not mean useful. Richard: Willis thinks Occam’s razor is a weapon to be used for conducting the “bloodsport” he regards science to be. Rog: It is more that he thinks that a trivially simple answer can show complex reality without any consideration as to how the extra complexity may be needed to uncover the real truth. Hence his attempts to ‘disprove’ any potential tidal parts of the overall temperature results by only showing an abstract treatment and then objecting when called on the lack of considering how the real world actually responds to those same ‘tiny’ inputs. I gave him the links to M2, K1, etc. and he claimed they were not relevant! Richard: Ocean SST’s lead surface air temps by three months or so. 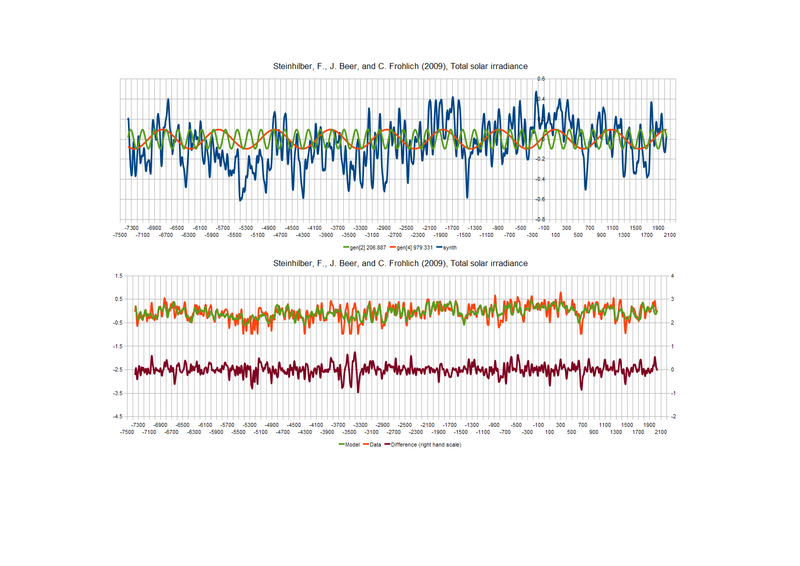 The ocean oscillations drive the ~66 yr climate cycles which drive atmospheric temperature. That’s why I’ve been concentrating on working out what drives the AMO and PDO. I was repeatedly pointing that out on WUWT to Willis, Leif and Anthony from 5 years ago. They can’t bear the thought that we’re right, so they attacked our publication of the solar-planetary theory, going along with Rasmussen’s unsubstantiated and incorrect claim that we didn’t use any outside reviewers. WUWT has sided with the IPCC, James Annan and his co2 driven climate cronies, and Greg Laden and his badmouthers. Their ill considered action threw some of the worlds top geophysicists, astrophysicists and oceanologists under the bus. All because of a personal vendetta against Nicola and myself. Stupid doesn’t begin to cover it. Rog: I am favouring that simple tidal influences may comprise a surprisingly large portion of the variability we see. There is significant ‘energy’ in ‘cyclic’ variability (quasi rather than sine true) at shorter that 75 years in length in just about all of the climate data series. There are few mechanisms that could cause such responses in the system AFIK. More and more papers are coming out that demonstrate just this cyclic variability. Sooner or later people will have to deal with them. Currently I am pondering if a mix of 55 – 65 -75 year Saros tidal cycles could explain it all! Now that WOULD be leap in the dark. When sudden warming takes place high in the atmosphere, it initiates a chain of events that tends to displace the polar vortex between 14 and 30 days later. I think someone he read me? I got into it with Willis over his (in my opinion) gleeful and unwarranted attacks on all the people involved in the Physics Journal mess without really knowing what happened and without any real facts. Needless to say, he could not even understand what I was complaining about — or so he claimed. What I would like to see someone do some day is write a short description of what the talkshop crew is proposing that the Willis/Anthony/Svalgaard axis finds so offensive. As far as I can tell, no one here is claiming that our climate is driven by pink unicorns or anything like that. Question for Nicola and or Richard. Given the difference of around 2 w/m^2 TSI at the top of the atmosphere in airless space, how does this difference translate to the surface measurements. I note that NOAA has been collecting bouy data on insolation at the sea surface for some time. So when the AGW people who discount the % of change in TSI as to be insignificant is this in fact a valid means of comparison? IF say TSI drops by 2 w/^2 from the high of the solar cycle to the trough, does the surface drop by the same percentage at the top or by the same quantity at the top, i.e. 2 w/m^2? The word they like to use is ‘cyclomania’. In other words as soon as the word ‘cycle’ appears they blow a fuse. Mark: In brief, we propose that the whole solar system is vibrating due to the mean motion resonances operating in it. These interact to produce the cyclicities found in the terrestrial paleoproxy data via direct effects on planetary (and indirectly by effects on differential solar) axial spin rate changes. This is all dismissed by team wassup because they think the tidal forces of the planets on the sun are too small to affect solar variability. It doesn’t matter to them that mean motion resonance transfers energy in a different way to tides. They haven’t read the extensive astrophysics literature on the subject. Indeed they don’t even know the body of literature exists. So far as they are concerned, cyclic resonances and spin-orbit couplings are ‘numerology’ and ‘cyclomania’. The phrase ‘thicker than a bricky’s butty’ comes to mind. But it’s worse than that. They deliberately misrepresent our work in order to encourage their readership to dismiss it without giving it a chance to develop. Petty and nasty behaviour. Thanks for the short explanation. The climate record is one of cycles (with no humans around to be the cause), and so it would make much sense to me to be looking for cycles and the causes of the cycles. After all; what the heck caused the massive glaciers of ice ages and then their melting and planet wide warming in the long ago past? The record of ice ages is one of cycles so how could any mention of cycles set off the WUWT axis? Weird. I am not sure if your hypothesis is right, but I am sure that we need to look at it. In the end, something causes the cycles. It’s a shame to see vitriolic animosity breaking out in the anti-Warmista Camp when the whole effort should be directed at the main enemy, CAGW. It is important to maintain a sense of perspective in these matters and not seek cheap victories over what are ultimately, allies in the struggle. ntesdorf: I agree, and bit my lip four three years. But now the direction is clear, and we’re forging ahead with a better theory. We have to fight our way past the opposition, whatever badge they wear. 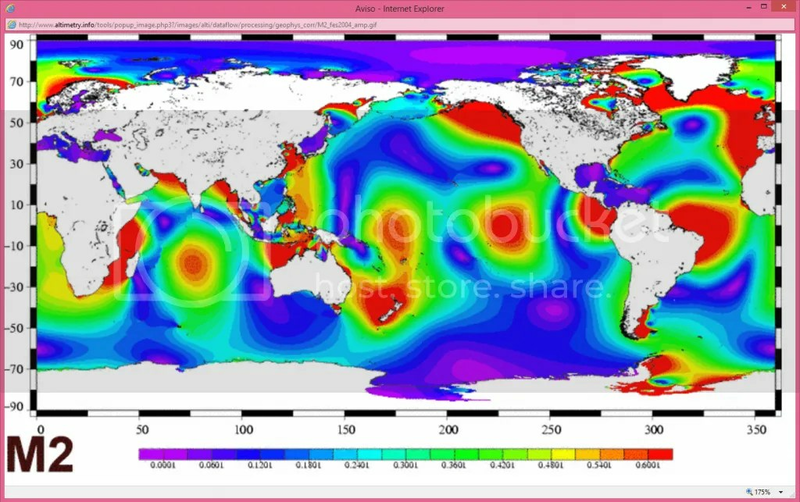 Rog – do you know if there is any point on the planet where the actual incoming radiation is measured at TOA and at the earths surface and monitored over time with cloud cover etc to see the measured effect of the atmosphere on the radiation levels? All I have been able to find is the model of the “average” system? The problem with the Willis/Anthony/Svalgaard axis is that these people have a modest understanding of science. In their opinion if something is not fully understood it is not “science” and people who try to advance the scientific knowledge by investigating the new phenomena are not scientists. Essentially these people think that “science” is only what already written in the college textbooks. They have no understanding of frontier science where things are developed. It is evident that there is something out there that cause the entire solar system to synchronize and the distance is not a problem. Willis/Anthony/Svalgaard simply do not accept that the universe is more complex that what they are able to think. 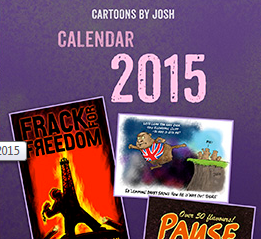 in the fight against the warmist lobby. Leave them to it, it is most likely the fastest way to defeat the BS infecting our governments. the status quo of concensus science is starting to be questioned in all fields. with free thinkers pilloried. Thank whomever it was for the internet for real freedom of thought. Thanks also for blokes like you, my final years may be happy, seeing real scientific discoveries. Rog: I am more convinced that the gas giants ‘play’ with the Moon’s orbit and thus provide a multiplying lever to their interaction than I am with LOD variability causing a direct effect. The problems are to do with acquiring and analysing the required data. Nicola: I think that one of the most often overlooked patterns is the Leap year. The observation that the Earth and Sun are only rotationally locked in 4 years, not one. I suspect that we may be seeing a mixture of 3 and 4 times the Saros cycle being seen long term as half way between (i.e. 3.5). That would explain all cycles from 55 to 75 years. This debate reminds me of the “Big Bang” versus Fred Hoyle’s “Continuous Creation”. Back then I was studying physics at Pembroke College, Cambridge so I supported Fred Hoyle (Our Guy) without much understanding of the issues. Today, everyone believes in the “Big Bang”. Today I find Nicola Scafetta much more convincing than the CAGW “Consensus” scientists. I am much better informed than I was as an undergraduate fifty two years ago. Nicola is presenting “Hard Science” while the arguments of his opponents rely on “Ex Cathedra”, “Ad Hominem” arguments because the science is not one their side. All physics theories are eventually shown to be wrong but one should aim to support the hypotheses that come closest to explaining observations. I support Nicola because his theories are based on observations rather than models. You don’t need to be defensive given that the mighty Anthony Watts has cast you into the outer darkness. WUWT does useful work but it accords too much weight to Willis Eschenback and Leif Svalgaard. While I respect these folks I seldom agree with them. They won’t make it into the scientific pantheon that runs from Isaac Newton to Albert Einstein. You are to be commended for presenting ideas from unorthodox sources..
We nowadays live in the deepest intercontinental slums of science junk with plenty of areas where what’s called ‘scholarly’ work is just clerical work [citing Noam Chomsky] and journals like Nature [have] degenerated to a tabloid level [citing notrickszone], but apparently the slums, clerics and tabloids (denominator? ignorance!) have become role model for team wuwt. In the slums’ and tabloid’s science junk it is phenomenally rare to effectively find scientific work which strives to reignite the candle of hard honest work to achieve substantiated research results. Thank you team tallbloke. For readers who can’t get enough of empirically testable scientific work I suggest, as an appetizer, the proposed experiment Testing Bell’s Inequality. This is a phenomenally rare experiment with plenty of links (almost all) to references which are not buried in the underworld of clerical paywalls. Wayne J and Galloping C: Thanks. I’m driven forward by the promising results we’ve been getting from our data, and buoyed up by the support so many people have shown us. Not just regulars from here and/or wuwt, but also other bloggers like Jo Nova, Pierre Gosselin, the Pointman, Verity Jones and others who have written supportive articles or reblogged our stuff. I’ve been getting email from ‘proper scientists’ too. Some of them appalled at the way we’ve been treated by Copernicus (the innovative science un-publisher), and some asking questions about the science we’ve been doing. There is growing interest in our work. Rog: I have no doubt your work has merit. I am just pointing out that a Lunar influence on the same upwelling (if modulated by the gas giants by the same spin-orbit coupling) would provide a much larger amplitude outcome here on Earth than a direct influence on LOD is likely to give. It is just a matter of magnitude, that’s all. Hi Richard: I think the Lunar effect is primarily in changing horizontal tidal components as its declination and line of nodes cycle around. The direct coupling between the positions of the other planets and Earth’s axial spin rate will affect vertical mixing via a sloshing and leveling effect as the angular momentum of the oceans isn’t fixed in relation to the solid globe. I agree that it’s complex, and this is why we shouldn’t make a-priori assumptions about relative magnitudes of effect on surface temperature. I did a rough calc on the LOD effect, and the volumes of upwelling cold water (and nutients feeding plankton blooms which affect cloud cover) are non-negligible in their effect. The biosphere is important too, in terms of its effect on albedo at different altitudes in the troposphere. Rog: I wasn’t trying to make any such a-priori assumptions. I was pointing out that there is a good mechanism for direct influence from the Moon from an indirect influence on the Lunar orbital patterns by the Gas Giants. As such it would be difficult to distinguish which actual mechanism was predominantly causing the effect as the periodicity would be the same. In truth there are probably components from both in the outcome. The tricky bit is in trying to derive a correct proportion. Richard: So far as I’m aware, the Lunar component of LOD variation is small. Rog: If you can tie the gas giants to LOD then it must also be possible with the same parameters to tie the Gas Giants to the small variations in the Lunar orbit they cause. Thus the two would be running with the same input factors. Just offering another potential route to the same/similar outcome. LOD is known to be sensitive to Lunar orbital patterns and Eclipses in particular seem to influenced by this parameter. At present this is only a possible suggestion I’m afraid but one I think worth pursuing. Richard; the whole field is wide open at this stage, which is why I reject any a-priori ranking of effect magnitudes. Reminder I have done very detailed work on LoD. The lunar orbital signature is very precise and in the form of modulation components relating the 18.6 years. This data is somwhat limited by technology and is very poor far back in time. Terrestrial effects are also present. I don’t recall anything else of an identifiable nature. Gravitational effect from other planetary bodies are irresolvable in such poor resolution data. In it you’ll see this plot, along with some discussion: The Y-axis is milliseconds changes in LOD / 10. i.e. the magnitude is around 3ms over 30 years. Please tell me the magnitude of the Lunar effects you refer to. The ‘solar motion relative to the solar system barycentre is equivalent to the sum of the gravitational forces of all the rest of the bodies in the solar system. So I’m not sure what you mean by ‘irresolvable’. Rog: The direct effects of both Lunar and Solar tides are easy to measure and certainly have the largest magnitude of all. Once beyond those immediate factors and looking as to if any variations that may influence them as small added deltas to those larger signals then, as Tim notes, trying to sort them and other factors into a defined order is always going to be difficult with the short data series we have. You may well be correct and LOD changes brought about by the Gas Giants may well be next in line, magnitude wise. It is just that the concept of levers and very small influences acting on much larger forces leads me to question if changes in Lunar orbit might be also a candidate. As I say, it is only a suggestion that may be worth considering. So far I can find no work that has rejected it outright, which is one small (very small) step in the right direction. Richard and/or Tim C. Please state the magnitude of LOD variation caused by the Moon. Richard: Please note that the spin-orbit coupling we have discovered is NOT repeat NOT a tidal effect. It is a resonance effect. Totally different beast. Resonance has reshaped the entire solar system in the past. It is FAR more powerful than tides between distant planets. What we have found is that resonance is still synchronising both orbits and axial rotation rates in the solar system. The conjunction cycles of the gas giants cause librations in Earth’s axial rotation rate AKA LoD. Rog: LOD – you miss the point. You can calculate an effect based on LOD changes from influences by the Gas Giants and derive a perfectly valid conclusion. It is also possible to observe that those same orbital factors from those same gas giants can influence the Moon’s precise orbit and thus may provide an indirect influence through that path also. One conclusion does not invalidate (or support) the other. Resonance is indeed a big shaper of orbital and rotational parameters in the solar system. Resonance induced LOD changes may well cause additional sloshing (a lovely technical term 🙂 ) in the ocean basins. There is a lot of sloshing caused by the direct tidal effects already though, so magnitude matters. Not saying you’re wrong, just not understanding the ratios yet. Hi Richard, longer reply from bigger keyboard. Glad you are thinking about and discussing this. Please continue. The data pre-1960 is very poor. The signature of gravitational effect will be extremely precise, no vagueness. What you are trying to deal with is a whole different league of effect, full 3D if not more, rather than direct between two bodies were there is little third axis. In addition the effect is on a rapidly moving body whose orientation to the forces also rapidly changes. Way beyond me unless it was a longer term specialism. From a quick look at results. The largest lunar effect is 0.000162 rms.at 13.661[*] days. I’ve never thought about the units, I assume seconds. * These periods are actually modulation clusters of lines, in some cases with a dominant line but as I recall tend to pairs but intermodulation occurs so there are trains, fleas have critters too. Rog: We appear to have a signal that is around 60 years in length in all of the temperature data. I know that this has been assigned to various potential causes. Your treatment of LOD is one. I know that you can calculate a result based on that and I have no way of determining if that outcome is correct because I cannot assess the magnitude that can be validly assigned to it. So I cannot criticise it because I am not competent to do so. I do note that the signal I have analysed is not symmetrical. It appears to have a slightly longer period in the ‘bottom’ half than the ‘top’ (at present anyway). This could be down purely to the fact that that we only have two samples! (Two – that’s in coin toss land really). However if that observation is correct then the possibility arises that this is a mixture of 3 times 18.6 and 4 * 18.6 years (aka the Saros cycle) . Earth is rotationally locked to the Sun in 4 years,. not 1, so that could be the reason for the 4. This would make an average of 3.5 * 18.6 years, long term. It also might explain why the signal comes and goes, so to speak, at times. This does all presuppose that the Lunar gravitational field is what underlies all this, but we do know that tides are a significant influence of global temperatures, particularly with the oceans. As yet this is but a tentative suggestion. It has a physical mechanism of some power acting on temperatures and that is capable of such an outcome. The problem is how to determine if the various patterns down through history match with what we know. As the high quality temperature record is only since 1850, any such ‘proof’ is a long way away I suspect. As to why the Gas Giants, well they play with the Lunar orbit. If they push it up and down then the excursions will be larger or smaller over time. We know we do not know the Lunar orbit that well. In the distant past, eclipse do not follow the JPL clockwork quite so well as we would like. Indeed there are numerous suggestions out there that the Lunar orbit is not yet fully defined (for periods longer than 100 year or so anyway). Fine for getting there next week, not so fine if we were to predict for next century. RichardLH wrote: In the distant past, eclipse do not follow the JPL clockwork quite so well as we would like. If by that you meant delta-T “dT” (before AD 1600) then in addition we were surprised by: In the recent past, observed eclipses did not follow the JPL clockwork quite so well as we would like (from 400 to 1800 AD). I agree it is always possible to match and mix orbital phenomena between planets and luna. And also that Newton has not given us (in more of my words) something that allows us to tell which is which (almost only pairs of bodies can be mastered with Newton’s theory; OT: this was already all too complicated for Einstein so he reduced that to 1 and only 1 possible body). Let me begin with: many papers just take cycle numbers 18.61, 9.305, 8.85, and 4.425 out of academic text books instead of making own observations. There are many observations which can make impact but do Not appear as ‘settled’ cycle numbers 18.61, 9.305, 8.85, and 4.425. My preferred example is luna’s motion in terms of line-of-apse and line-of-nodes. It is so easy to plot this motion, just make data points for +/- max inclination and +/- max apse, then filter the occurrences with less than 1 or greater than 12 days of temporal distance. This easy diagram shows the phase lockstep of both lines at 1095.25~ days (37.0~ syzygy, 3 years). Now where does this elementary relation (if A and B then C), with the most powerful orbital elements (A.apse, B.inclination, C.syzygy), appear in the literature, except apparently nowhere? The elementary phase lockstep can be observed at the horizon with naked eyes. Alas. I’ve come to understand that these 3 years phase lockstep is a subharmonic of the first point in time where the line-of-nodes made 1 more revolution than the line-of-apse, in figures (using standard mean days) that is: 80.4912 and 79.4912 (this is almost perfect 6 years). There is (of course) a small drift of the phase lockstep, and that can be measured (aka. matched and mixed) with the planets’ position. And there is (of course) some drifting component which adds n days to 3 x 6 = 18 years and arrives at the Saros interval (and from there at the 1/2 Saros or Sar interval). The focus of my interest is on equinoctial years, and therefore I concentrate my work on the Metonic and quasi-Metonic cycles (57 years, 65 years and 95 years). They have the advantage that they (and their subcycles) can be measured with eclipse distance (also at +/- 1 and +/- 1/2 syzygy), and therefore can be measured by rational evidence from repeatable observations (which includes reports from the distant past if one believes in man-made [fictitious] calendars). Chaeremon: I realise that there is a 3 * 18.6 in the figures. I am pointing out there should also be a 4 * 18.6 also. Together they make up the range of cyclic phenomena that have been observed in the temperature data. 55, 65 and 75 years or periods very close to those are found everywhere we look. They most likely interfere one with another in a pattern that is even more complex. Is that observation in any way contradictory to yours? RichardLH said: I realise that there is a 3 * 18.6 in the figures. I am pointing out there should also be a 4 * 18.6 also … Is that observation in any way contradictory to yours? I would never say no to (multiples and/or) fractions of equinoctial years, so I say: I don’t know [yet]. Is there something which can be compared, a signal or an event? have a diagram? This has a structure that shows something in the 55-75 year cyclic bracket (as well as some function beyond 75 years as an underlying residual). As there are only two samples at that period in the data to date, the conclusions are thin to say the least. The real question is if there are suitable periodicity in the Lunar data that would match with those observations. If so, can they be extended backwards or forwards in time as well? Can we also provide some reasoning as to why any such matching periodicity can drive temperature (if they do indeed exist). If no such Lunar matching can be shown, then what are the other reasons for the periodicity so observed? How can we provide proof of that correlation? Richard: Harald Yndestad found a 75yr Lunar cyclicity I covered back in 2009. I don’t know how he derived it. Rog: Yes I know. The links are all there. It is just that trying to pull it all together is the hard part. ~75 year lunar? No unless you can suggest a novel way the moon wandered, but that must agree with the hundreds of years of lunar observations. If the moon had a simple orbit the signature would be simple. The orbit is simple but moves and that leads to a specific signature in the best available data. If there was a significant longer item that would be there too. It isn’t. I need to clarify something: the slow movement is precisely encoded in fast data and hence does not need long data. This does need precise data, what is available is marginal. I suggest that whatever is causing the ~75 y is something else. RichardLH, 1] I cannot see your 55 years nor your 75 years in the diagrams; you said there are only 2 occurrences: please talk to me like a child (I’m not a native speaker, anyways) and tell the coordinates. 2] I’m very interested in (integer fractions of) 75 years and in all nails that can be hit with a 15 (years) pounds hammer. Let’s insist on observable events and please show me. You will see that the ‘zero’ crossing ~60 against the 75 shows that the result is not symmetrical. Top half is shorter than the bottom. Now that could be down to the 75 year line needing to be lower and thus cutting the ~60 truly in half. The only way to determine that is to wait for longer data! Alternatively it could be that the 75 year curve is accurate and that it is truly asymmetrical. Hence the question. No it is a beat pattern with 4 * 18.6. i.e. Leap Year against Saros cycle. I should mention that the base filter I use is pitched at 15 years. It is a Cascaded Triple Running Mean filter so removes completely any 15 year or less cycle in the data but preserves and shows everything above that value. Al the way up from 15, it does not care. You can, of course, get the lower band by subtracting the greater than 15 year output from the original to get a less than 15 year high pass band if you wish. 1] your 18.6 is not the Saros (which is ~18.03) but instead the precession cycle of the nodes; there has been a lot of talk here on the line-of-nodes, you may perhaps wish to check Ian Wilson linking it to tides. 1a] FWIW, 229 syzygy (18.51 years) have the most active eclipse regions on both ends (I routinely check 7 kyears), and 230 and 228 syzygy are also in the eclipse seasons but occur with small frequency. 2] it may be that your 18.6 is rather 19 years (Metonic), can you make the filter for 19.0 and 57.0 years (colors as before) so we can compare and assess. The filter I use is just a cascaded triple running mean and can be used for any integer value of the base period it is used on. In most cases this is Months but Days or even Hours are possible with the right data source! The CTRM gives a very precise cut-off in a very near to Gaussian output. In fact it is slightly better than Gaussian in that it completely removes the chosen value, whereas Gaussian does leave a small amount of leak through. You can even modify the values and sweep the filter up the band and see where the major difference points lie in the output function. That’s an old audio trick to find areas of interest! where the 361 (i.e. 180*2 + 1) wide window is the one that best matches with the full kernel CTRM filter for 15 years and that can therefore be used to ‘prove’ that the parameter choices are ‘right’. He was the one to suggest S-G so I just HAD to accept it as being right! Never interrupt an enemy when he is making a mistake or so a Frenchman once said. Rog: I am a complete beginner here. What I do have from observations is that a periodicity exists in the temperature data. The problem is that it is so short a data series that a wide range of values can be used to make it. I rather suspect that it is not a single factor but more than likely a combination of the effect of more than one. So, assuming that this is tidal related which does seem likely because it is already known to have an effect on temperatures of the ocean at least, then any modulating factor that can come to either singly or in combination with others and produce a curve which can be overlaid on the temperature figures and match that has to be what we are looking for. Where is this in data? I have no idea what is being talked about. tchannon wrote: I have no idea what is being talked about. Me neither. I still wait for things being clarified. I am looking for candidates that fit the rather broad 55-75 year range that the fairly imprecise (because they are so short) data series present. Lunar orbital candidates because that is well known to directly affect climate through directly modulating ocean temperatures and transfers of energy in the system. I need to understand better how to reflect any such orbital characteristics into Lat/Long/Time patterns here on the Earth. What I can say is that whatever patterns that do exist must currently be a one end of a range and probably have just started to trend away from that maximum. Also at a similar place in 1945 and 1860 .The pattern should also be at the opposite end to where it is now in 1975 and 1910. There are longer series that may/can be used to find other relevant times further back, but with much lower resolution and hence time precision. Then I need to understand how those patterns cause an actual effect here on Earth. So not just correlation, causation as well. Do they have a possibility to modulate a flow, a distribution, an observed climate data series (not temperature) directly? How, why and possibly even where? So far, whilst it may be true that we have found that such orbital characteristics that may match the above timing requirements, from reading all the work to date it has not been possible to get the suggested outcomes/effects to be larger than the signals that are known to exist. What I suspect is happening is that some larger effect is modulated/levered/altered in such a way as to provide a slow, long term change in its outcome. I do rather recognise that given the short data set my quest will prove futile, but that wont stop me looking. I am here as a student. Enquiring of those who know much more what there is that can provide such potential candidates. Expressed as, how they are observed on a Lat/Long/Time pattern here on the Earth’s surface. For now I am only capable of using the analysis to shoot down what is most obviously not right. SO2 requires zero lag to have the effects claimed. A very unlikely outcome. CO2 does not match well before 1850 (probably because they have so resolutely concentrated on after after that period). Most proxies are a joke. They do not agree one with another even just 50 years back in time or with the thermometer record. They certainly do not agree with the few temperature records we do have in that period (though to be honest those can only be described as regional and therefore may not provide direct comparison). Depending on their mass, rigidity and composition, objects have a characteristic frequency of resonance. Judging by the voluminous evidence in paleo time series, the Earth’s principle characteristic frequency is around 60-66 years, with sidebands at simple harmonic ratios of this number, especially in the ratios 2:1 3:2 and 3:4, i.e. at 45yrs (hudson bay and Siberian beach ridges), 44yrs (double solar Hale cycle) 44.7 yrs (inner solar system orbital commensurables), 60-66yrs PDO/AMO and many others seen in Marcia Wyatt and Judy Curry’s stadium wave paper), 75 yrs (Yndestad’s Lunar period), and so on. Both my prp papers cover some of the celestial periods. The other prp papers do too. Enjoy the reading. That the proxies don’t agree temporally doesn’t matter much, since various internal lags due to the hysterisis and inertia of the components involved and the chain of cause-effect and feedback will inevitably introduce these (Wyatt and Curry again). For N. Hemisphere there are lots of AMO and N pacific related papers to study. For S. Hemisphere a good look at Ian Wilson’s big recent paper on Lunar effects is a must. Erl Happ’s work is a good read too. Rog: I know. I have a growing collection of papers that I am wading through! My problem with long term resonance is that there are very few structures that can resonate in those sorts of time periods. The Earth (rock) and Oceans figures are nowhere near those in value. Therefore I suspect a subtle modulation of a faster series is more likely. I cannot find a treatment of the Earth surface gravitational field vectors on a Lat/Long/Time basis that may help as a stepping stone to the answer. Richard, a good and fair riposte to my oversimplification. OK, here’s an idea. The two biggest planets in the system Jupiter and Saturn have demonstrable effects on the tiddlers between them and the Sun (which they also affect) at various timescales (see my papers and plenty of the posts on this site). Their conjunction period is ~20 years (19.858) and this leaves a noticeable signature in LOD (see my second paper) but not as big as the 60yr signal. The Sun is tilted at 7 degrees to the ecliptic, and if as I suspect there is a magnetic component to the spin-orbit couplings we’ve identified, then the effect of the triangular triple conjunction cycle of J & S (each conjunction takes place a couple of degrees off 240 round from the last) will be modulated over a ~60 year period due to the different declination above or below the solar equator it takes place at. This is the period at which we see the big LOD effect on Earth because Hysteresis and fluid damping smooth out the J, J-S and S periodicities. That cycle in turn is modulated over an around 800yr period by the slow precession of the triple conjunction relative to the tilted Sun and its ‘ballarina skirt’ electric current sheet, the HCS. We can be fairly sure that there are resonant effects at this longer timescale because the precession of the Venus-Earth conjunction cycle takes 1199 yrs, putting it in a 3:2 resonance with the 800 yrs it takes J&S precession cycle to rotate by 1/3 (one ‘point’ of the triangle to the next). The J-S conjunction cycle precession period is therefore 3×800=2400yrs, which is in a 1:2 with the V-E conjunction cycle precession period of 1200yrs and also in a 3:2 resonance with the ~3600 conjunction cycle precession period of Uranus and Neptune. 2228-2403yrs is the Halstatt cycle, a recognised climatic cycle on Earth coinciding with 13-14 U-N conjunctions and 112-121 J-S conjunctions. 800-1200yrs is the periodicity of the warm-cold cycles between the Mycean-Roman-Medieval and modern warm periods. So we build our picture from the orbital periods and conjunction periods of the gas giants to the longer periods of the Halstatt cycle in a logical progression, looking at the resonant ratios between planet pair interactions along the way. The Sun fits into this too, because it is as subject to resonance as everything else. So the V-E-J cycle of 11.07 years coincides with the solar cycle length, along with a sideband resonance of Saturn-Uranus at the same period, and the Hale cycle length around 22.3 years also has several coincident planetary resonances matching it. The ~66yr AMO is a game of two halves. In the cool half it has 3 solar cycles, two of which are magnetically north, which doesn’t reconnect with Earth’s magnetosphere. In the warm half it has 3 solar cycles, two of which are magnetically south, which do reconnect with Earth’s magnetosphere. Of course, solar cycles are rarely 11.07 years long. The SCL tends to cluster around 10.38 years (a V-E-J frquency, and 11.86 years (Jupiter orbital period). So the length of the AMO/PDO varies too. Then there’s the Gleissberg cycle of around 88-90 yrs, which is in a 2:3 ratio with ~60yrs, and coincides with a bunch more planetary frequencies (see my main paper). Beyond that there’s the Jose cycle (179yrs), The De Vries cycle (Lunar), and so on. There’s a lot to do, but it’s a logical framework which has much more explanatory power than “we’ll avert our eyes from the AMO/PDO, Hudson Bay and Siberian beach ridge staircases, gleissberg etc and call it cyclomania” approach. Taking a subset of these periods R.J. Salvador has been able to reproduce the sunspot number time series to R^2=0.9, and also a good match to 1000 years of 14C data. We have a testable prediction, which is what science expects. Rog: I have no doubt that what you say is correct and a possible explanation for what happens. My problem is to do with magnitude (as experienced within, say, 10 km of the Earth’s surface which is where this all resolves out) against the known background. My problem with the 11 year sunspot cycle is that, although there may be some influence on clouds or in the polar regions, is that sufficient to overcome the very large constant(ish) values that also occur? The (natural?) variability in the background appears to be larger than the variability in the cycle. What I find surprising is that no-one, as far as I can tell, has ever bothered to work up what the gravitational vector plot looks like at or just above the Earth’s surface when considered on a Lat/Long/Time basis (long term). And then seen if that corresponds to movements or variations in the oceans, atmosphere. etc. on similar timescales. Such is my quest. It may well turn out to be a red herring but…..
Richard: The gravitational vector isn’t going to give you the answer to your magnitude question, because resonance doesn’t work like that. Resonance is an induced oscillation which isn’t relying on the instantaneous energy supplied by the force that induces it. The resonantly oscillating body is induced to redistribute part of the overall throughput of energy from one part of its system to another in a manner which amplifies the oscillation which is in time with the inducing force. Rog: I am not looking for resonance, I am looking for modulation – which is a totally different beast. I do rather know how resonance works and I also understand about damping and dissipation. I am trying to find periodicities and mechanisms. Richard: Modulation of what? Soli-lunar tides? I’ve asked already what you believe the magnitude of tidally induced changes to LOD are already. Do you know? That’s not a snarky question, I genuinely want the answer. But as I said earlier, the upwelling of cold water and nutrients caused by a 3ms/day change in the rotation rate of the solid Earth is bigger than you’d imagine. I’ll run through the calculation again. Then there’s the solar variation. Rog; Yes, I suspect that the Earth’s surface features are a magnifier of Soli-Lunar gravitation vector maps in such a way as to produce the required effects. But that is rather putting the cart in front of the horse. I have a reasonable temperature series. With an approximate cyclic pattern in it. That actual cycle length is too imprecise to be able to correctly assign period(s) to it IMHO. So to look for a corresponding pattern as played out by delta gravity on the Earth’ surface seems to be the next step. Delta Gravity as a modulator of the rather large tidal effects does seem to be a potential candidate as it certainly has the capability to raise itself above the background ‘noise’. It could also be as you suggest LOD variations. But I still would be more comfortable with that if we could localise it to geographic areas. I don’t know if you have done that. There is a LOT of sloshing that goes on from the daily tidal so understanding how that LOD delta might overcome any such larger vectors is fairly important I would have thought. As to tidal LOD against I’m not against it. I just need to understand how big a delta it supplies to the background cycle. And no, I do not know how to calculate that delta. As a percentage of the cycle it might influence. Also where and how on the geography it might change things. As you may tell, the engineering background I come from rather does require a nice, ordered sequence that has no missing steps before I can start to believe it as being the ‘true’ explanation. The way I see it, there are significant changes in Ice volume and flow that could well be influenced by delta gravity. But then we are back to a gravitation vector time series and seeing if changing Arctic patterns would support that or not. How does LOD (which would tend to show up around the Equator I would have thought) cause that sort of change? Richard: If you look at the plot in my paper 2 you’ll see a ~3ms/yr change (reduction) in LOD over 30 years from 1880 to 1910. That means that water will pile up against all Western coasts in the world as the Earth accelerates and the ocean doesn’t. After that the opposite happens as th earth slows down and the ocean, which has just been brought up to speed as internal friction has dissipated the 30 year tide fails to slow down. So, how much? And what happens? Well the water that piles up with this tide that runs one way for 30 years has to go somewhere. Gravity levels it out by spreading it across the sea surface. A circulation is set up with warmer surface waters being subducted on one side of the ocean as colder deep water upwells on the other. That this really happens can be seen from records of fish abundances on each side of ocean basins. The upwelling brings nutrients with it, which plankton, the base of the foodchain thrive on. I did a rough calc a while back, I’m a general engineer who isn’t scared of working with ballpark estimates. I need to improve it though, so stand by, I have dinner to make first. By the way, you’re right, the biggest volumes will upwell at the equator where the velocity is highest. move vast amounts of water around each day across the same basins. Add to that known ocean currents which move water as well and I am struggling to see how such small accumulative extras from LOD can play such a large part. 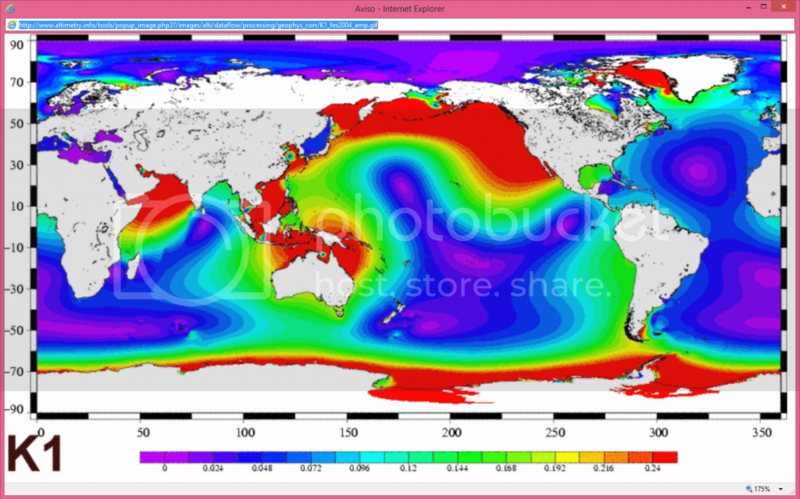 Do you have any long tem gridded sea water temp data that would backup the claims? I would have thought that it would be the obvious next step to prove the chain valid. Or perhaps you have some other methodology that is an alternative. Thanks Richard, I’ll be back to this as soon as I can. Too much happening, as usual. You’ll get used to me vanishing due to such disruptions. Still thinking about it. Thought: tides flow in and out within a day. LOD change is multidecadal. The latter will set up a type of circulation the former can’t. I have no problem with accumulated change on the top of much faster change. That is, after all, what I too am looking for. I am trying to work this out as a sequence though. A step by step methodology. So far all I have is a rather nice tool that allows for sensible comparisons to be made on longer times scales. It does serve to cook some geese. Witness Jan’s claim that PDO and Global temperatures are not linked. Those lines just happen to wriggle the same then. Pure chance is all it is 🙂 Yea right. And as a guide to the future? Well that PDO graph should give many pause for thought. Looks like PDO should hit bottom around 2020, also solar min if cycle 24 follows ‘normal’ behaviour (I doubt it will). I wold expect a big el nino around solar minimum. But we may not see a minimum. I think cycle 25 may ‘overlap’ the tail end of cycle 24. Rog: I would concur with the 2020 bottom, but, as you will see from the graph I included this appears to be a very repetitive, cyclic pattern going back a long way so I doubt that solar cycles are the cause. Look up “Huygens Synchronization” for more. What you see in common with all the various experiments is a rigid board connecting the two pendula. In space, the ‘rigid board’ isn’t there, so how are the synchronising bodies connected? The options seem to be the gravity field and the interplanetary magnetic field. TB: how does a Foucault pendulum ‘know’ about inertia, or about the ‘fixed stars’? It doesn’t need to ‘know’ anything. It just keeps swinging in the same plane unless acted on by an external force, because that’s swinging things do when obeying the law of gravity. It keeps going in a straight line (as seen from above), and when it slows down and reverses, it moves in the direction of the point between the pendulum’s anchor point and the centre of the Earth because to do anything else would require additional energy input. That takes it back along the same straight line.